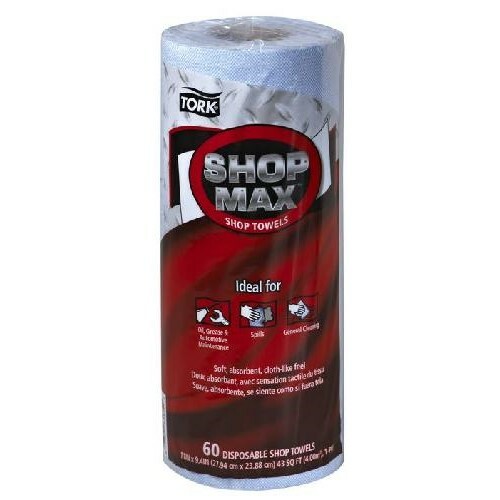 Tork Advanced ShopMax Wiper 450 Roll Towel is strong enough to power through oil, grease and solvents, yet versatile enough to be an ideal everyday solution for general cleanup and spills. Thick, cloth-like construction is highly absorbent and low linting, making it an effective, convenient towel for shop, auto and home. These multipurpose disposable towels are an excellent replacement for cloth rags. Their durability and high-performance characteristics make them a perfect choice for a wide variety of uses, from detail work in professional shops and garages to cleaning tools in do-it-yourselfers' workshops and garages. This product contains 85% Paper Content (60% Recycled, 40% Post Industrial) and 15% synthetic emulsion.